Was Yasser Arafat poisoned with Polonium? The late Palestinian leader Yasser Arafat may have been assassinated with a lethal dose of the radioactive substance polonium, scientists have claimed. Was Arafat assassinated by poisoning? 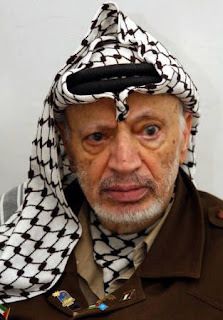 Arafat died in 2004 from a mystery illness, amid theories that he was killed at the hands of Israeli spy agency Mossad. But a new investigation has concluded that a urine stain on Arafat's underwear had traces of Polonium-210 20 times the dose needed to kill a human, the highly radioactive substance which killed Russian dissident Alexander Litvinenko six years ago. The 75-year-old's widow, Suha Arafat, has called for her late husband's body to be exhumed after the Al Jazeera investigation found the traces on clothes he wore in his final days.